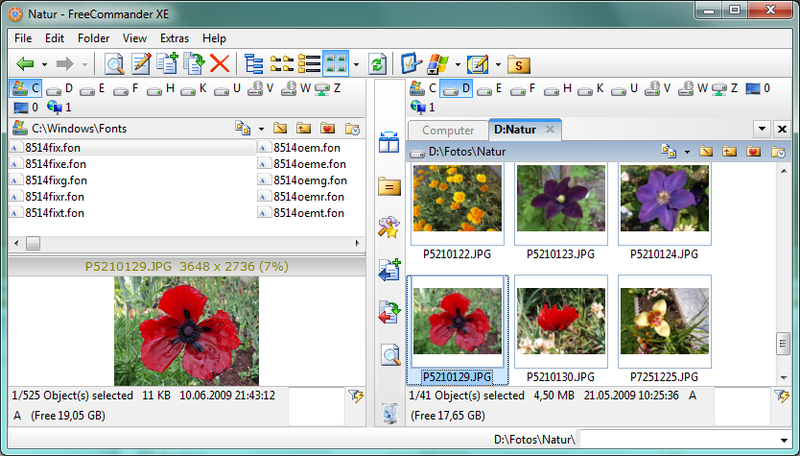 I sumbit this 2 panes File Manager, that I use since several months. Anyway TPFC-Database needs an update. FreeCommander XE is a totally new developed version of the program. The development is not finished, yet. This version is supposed to give a preview to the future version to present users. Since this is a preview version, bugs are possible. Excellent news. Good to hear they're still working on it. Part of my interest in muCommander is frustration with FreeCommander. VirusTotal reports FreeCommander.exe as infected. I really hate statements like yours! What exactly is your point? That FC includes a virus? That Marek offers us an infected application? Did you even realize that out of 43 AV engines, only 3 reported something? 3 very bad ones? Made by 3 companies so lazy that they don't care about their applications false positive detection rates? Did you even un-upx-ed FreeCommander.exe file prior to submitting to analysis? No! But you are bold enough to say what you said! And if you don't know what you're talking about, please restrain yourself from affirmations like that in the future! joby_toss wrote: I really hate statements like yours! Are you the creator of Free Commander XE? If so, you need to be aware that your app is generating false positives in some AV software. You should take steps to ensure that your app isn't flagged as malware by contacting the AV companies that are erroneously detecting your app as infected. joby_toss wrote: Did you even un-upx-ed FreeCommander.exe file prior to submitting to analysis? Calm down, C3PO. How many typical users would decompress a upx'd executable before submitting it for online malware analysis? It's also unnecessary to decompress the executable as most upx'd executables do not trigger a false positive, or they're identified as a packed executable rather than a virus. ReadOnly wrote: Calm down, C3PO. He he...that's funny! You're funny! 1. Not generating false positives is the job of the (anti-)malware company. 2. (Anti-)Malware companies are updating their DBs all the time, and stuff that previously didn't trigger a false positive, later does (even with heuristics disabled!). I know this for 100% because i experienced this myself - more on this later. 3. (Anti-)Malware companies have a history of not caring about false positive reports of small devs. Even if you as a dev do THEIR job by submitting a report to them, chances are they'll ignore it. 4. (Anti-)Malware companies have a history of declaring compressed binaries as trojan, sometimes WITHOUT clearly identifying that all that was found, was a packed executable. In fact, according to (anti-)malware companies, anything that is compressed is not trustworthy, because if you do that, then you probably have something to hide (does that argumentation-logic seem familiar?). I experienced this myself with one of my clients. I had a bunch of upxcompressed portable applications running there for YEARS, and then out of the blue i get a call, that the AV-software on all 8 PCs is showing trojan warnings. When i got there, what i was found was that after a db-update, it simply started to trigger trojan warnings on all upx-compressed binaries, even tough in the options detection of "heuristics" and "packed executables" was disabled! What did i do? I excluded all of my software from scanning. Better no scan than scans that do more harm than good. 5. This is a WIP preview version! Do you expect a dev to check for some lazy (anti-)malware vendors failing at their job for every damn build compiled? Your message was completely uncalled for, incompetent, useless and in fact harmful. We've been through the false-positive thing thousands of times. I have no problem with XE at all - I'm using Microsoft Security Essentials on W7 Home, 64 bit. It's the best FM around, bar none. If you use it, I would suggest a donation to the author - it's well worth it!!! nickoftime wrote: We've been through the false-positive thing thousands of times. Agreed but it comes up quite a bit on entry comments so I don't mind addressing it once more. ReadOnly wrote: Are you the creator of Free Commander XE? If so, you need to be aware that your app is generating false positives in some AV software. The problem is that if I was an AV company I would probably be more focused on possible threats than possible false positives. One author in particular Nirsoft whose programs make up a good percentage of our site has yet to have this resolved. I don't know how alert the VirusTotal folks are on that. In the mean time, users who are really concerned should check out one of the many sandboxing programs available to help protect your system without sacrificing access to the latest software. FCXE build 641 was released (it's getting very close to stable release). Help file is now available (online and offline) also in German and Spanish. For me, it's the best files manager!